This post is a little emotional because I am p***ed off at the moment, so take everything with a grain of salt. This is a message many Youtube-Videos in Germany are subjected to. GEMA is a German menace company which’s mission is, in short, to ensure that the artists are getting paid when somebody uses their work. So far, so good. 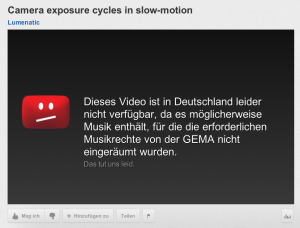 Today GEMA blocked my slow-motion video of the camera exposure cycles (in Germany, the US, Canada and some other countries). As with all of my videos, the music is taken from the sound library which comes with iMovie. I use no other music. It is only the free music which comes with iMovie. But now they claimed that the music is from one of their artists, Malik Adouane-Daimen. I do not even now this musician and I certainly have no music from this guy. And after I listened to some samples on iTunes I strongly doubt that the music from the iMovie library is even close to his. This looks like the filtering algorithms at Youtube did not do their job well. And I am sooooo tired of this. Every video in which I used music from the iMovie library has been charged with such a copyright infringement. And every time I explained this is not the case because it is – I repeat myself- music from iMovie, and every time the issue has been waived. Let us hope the video is unblocked soon. And, more strongly, let’s hope that the copyright laws in Germany are worked over heavily, and not by lobbyists but by people who know and understand the internet. Artists must be paid for their work, but we can’t have a non-governing body which is allowed to block content on the internet at will.